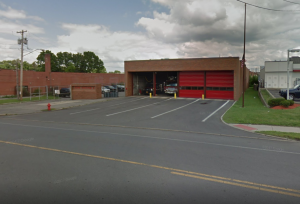 Project Description: The Fire Station No. 5 project is another example of the Save the Rain Program targeting a specific priority area for green infrastructure implementation. This project, within the CSO 007 sewershed, is intended to reduce pollution to Harbor Brook and Onondaga Lake. The project will help to reduce the overflows from the Harbor Brook Intercepting Sewer, all the while providing a new parking lot at Fire Station No. 5, located on N. Geddes Street. An infiltration trench will be constructed beneath the parking lot at the Fire Station. This green infrastructure practice provides water quality improvement through infiltration and storage, thus reducing overflows. The underground infiltration trench will capture a very large volume of stormwater runoff beneath the parking area. 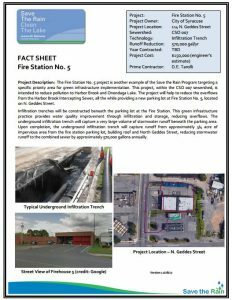 Upon completion, the underground infiltration trench will capture runoff from approximately 3/4 acre of impervious area from the fire station parking lot, building roof and North Geddes Street. This will reduce stormwater runoff to the combined sewer by approximately 570,000 gallons annually.